That’s fantastic! Can I install completely portable versions of Python/R using conda? I.e. ones that don’t need admin rights on Windows to install and don’t leave any residue behind? That was the driving factor in going down this route. Yes if you’re using Linux; haven’t tried doing anything similar on Windows but imagine it would work. A follow-up post on setting up jupyterhub for students at the University of Sheffield would be interesting. There have been several posts on the ipython-dev list in recent months on people using jupyter for different courses; I’m sure the ipython-dev team would be interested in hearing about anything you set up for students. FYI Jessica Hamrick’s post on the Rackspace dev blog gives a particularly good overview of the current usability of the project for this purpose. Windows is vital for teaching – at Sheffield at least. I’ll use the portable install created above to get us through the next two weeks which we are using as a dry run and pre-requisite set of sessions for a Bioinformatics module which will be delivered in October. I’ll work with the managed desktop team at Sheffield to get the Anaconda solution ‘packaged’ by then — kernels in Python 2, Python 3 and R to start with – all running on the Windows desktop. Nope, it was https://developer.rackspace.com/blog/deploying-jupyterhub-for-education/. The jupyterhub demo for Nature was concerned with providing Notebooks to anonymous users whereas Jessica was more interested in students being able to authenticate against the notebook server, complete Notebook-based coursework then the tutor grade submissions manually or automatically using a unit testing approach (see https://github.com/jupyter/nbgrader). Are there plans to introduce researchers to Jupyter using something like Software Carpentry workshops? This would be awesome, particularly if researchers could ‘try before they buy’ by being able to participate in the course using their own machines without having to install anything locally. There are plans but so far just a twinkle in my eye. I hope to have more time to devote to it soon though. Thank Will Furnass. The tip is awesome! I created virtual environment using conda in folder “dev”. Environment folder is named “pyenv”. 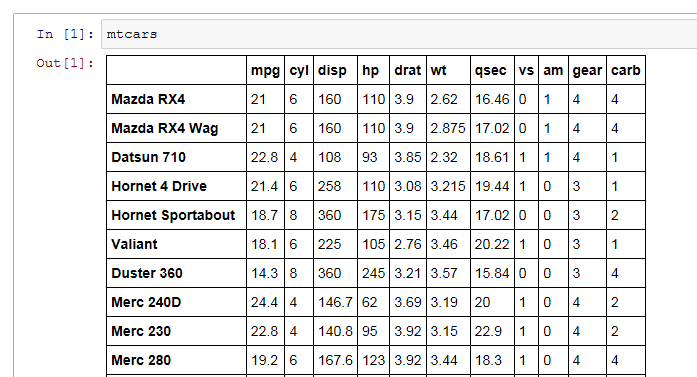 There jupyter notebook, numpy and matplotlib in it. I created shortcut file in it. In “dev” folder I created .lnk file and typed %windir%\system32\cmd.exe /c “”%CD%\pyenv\python.exe” “%CD%\pyenv\Scripts\ipython-script.py” “notebook”. 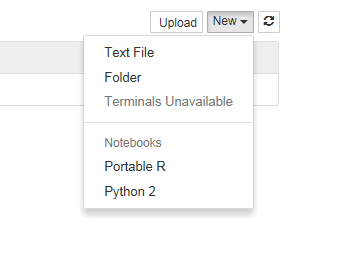 After doubleclick I see console with message “ipython notebook is deprecated will be removed in future versions. 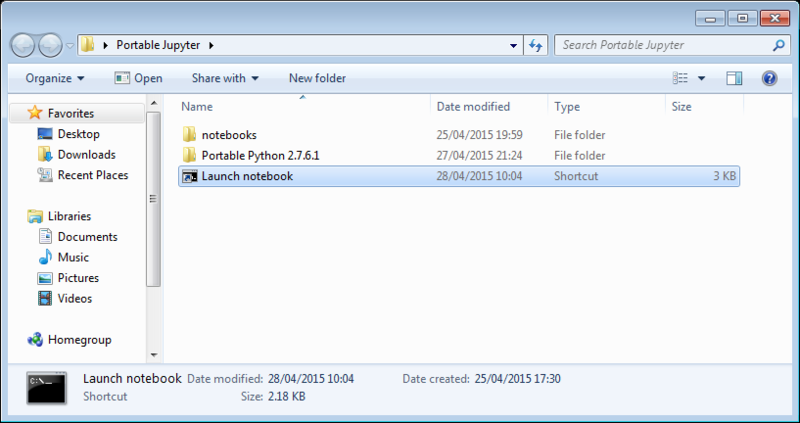 You likely want to juse jupyter notebook.” After 5 seconds jupyter notebook starts. I decided to modify relative link in .lnk file. New version is %windir%\system32\cmd.exe /c “”%CD%\pyenv\python.exe” “%CD%\pyenv\Scripts\jupyter-script.py” “notebook”. But at this case Jupyter notebook doesn’t start. Then I noticed strange: when I open cmd in “dev” folder and type in console pyenv\Scripts\ipython.exe notebook – all works fine. But when I type pyenv\Scripts\jupyter.exe notebook – I see error, that notebook isn’t jupyter command. I found answer myself. For Jupyter Notebook in shortcut properties target should be %windir%\system32\cmd.exe /c “%CD%\pyenv\Scripts\jupyter-notebook.exe” and start in should be empty. I got it working with PortableR and Anaconda3. The issue I had was to get jupyter in anaconda3 to “detect” the path for the R kernel. Turns out the solution was to add the `Rkernel/kernel.json` in the directory holding `python3/kernel.json` in anaconda3.